2015 Kia Soul Pros and Cons: Why (Not) This Car? What's it really like to live with an electric car? Do they feel weird? Is charging too much of a hassle? Do they have enough range to make them practical? To find out I spent a week with two that were new for 2015, the Kia Soul EV and the Volkswagen e-Golf. Earlier I posted a review that focused on the e-Golf. This review focuses on the Soul EV. Kia did more than VW to dress up its EV's interior. I'm not in love, but at least they tried. Why the 2015 Kia Soul? The top reason to buy any EV is fuel economy. Both the Soul EV and the e-Golf used about 20 kWh of electricity per 100 miles of suburban driving, with the Kia perhaps ten percent less efficient than the Volkswagen. Their EPA MPGe (miles per gallon equivalent) ratings are 120/92 and 126/105, respectively. With the average cost of a kWh about 12 cents, this works out to 2.4 cents per mile. Some people will pay one-third this amount by recharging at night in an area with low rates. Assuming 30 MPG and $2.50 per gallon (low by recent historical standards), a fairly efficient gasoline-powered car burns 8.3 cents of fuel per mile. Drive a little over 10,000 miles a year, and the annual savings works out to $600 even assuming 12 cents per kWh. Of course, that's quite a few qualifications. In cold or hot weather running the heat or A/C will significantly reduce range. To help avoid this, the seats in the top trim Soul EV can be heated or cooled. Those in the e-Golf can only be heated. Highway miles drain the battery packs even more quickly than the EPA figures suggest, because the EPA assumes a relatively low cruising speed. On a 70-MPH Interstate the e-Golf's range fell by about a third. The Soul EV, with a taller, chunkier body, should suffer at least as much. Still, most people rarely need to drive farther than these cars can go between charges unless they're traveling (in which case a non-Tesla EV isn't practical). Recharging via a standard wall outlet can take over 15 hours in either car. Anyone who will often drive more than 50 miles per day should seriously consider having a 240-volt wall charger installed in their home. Chargers cost about $600, but this is without installation, which can easily add another $600 (depending on the specifics of your house). 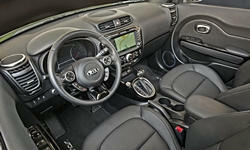 The Kia Soul's controls are close at hand and easy to use. For the EV, Kia clearly put a lot of thought into the instruments and infotainment system. The nav (unlike that in the e-Golf) prominently features a list of charging stations. It even takes the initiative to display a list nearby stations when range is down to 35 miles. The Kia system also provides more detailed and visually engaging EV-specific route information and driving efficiency aids. To get similar features on the 2015 e-Golf you had to use phone-based apps. The 2016 e-Golf has a new, improved infotainment system that should reduce this disadvantage if not eliminate it entirely. The rear quarter is the car's most handsome angle. Volkswagen has given the e-Golf unique wheels and front end trim, but to anyone not paying very close attention it looks like a garden variety Golf. A handsome car, but nothing that annouces "the future is here" the way a BMW i3 does. In terms of cosmetic modifications, the Soul EV is closer to the e-Golf than to the i3. Like the former, it shares all of its sheetmetal with a mass-produced gas-powered car. But the regular Soul is a more quirkily styled car than the regular Golf. The former's tall, squared-off body appears appropriate for an EV, even though it wasn't originally created for this role. The Kia's EV-specific cosmetic bits I could actually do without. The EV's white roof and wheels contrast too starkly with the neon blue body of the tested car. The combination suggests poor fashion sense rather than avant garde. If I were getting a Soul EV I'd get a different color combination, most likely white on white. Inside the cars is much the same as outside. The e-Golf's interior is handsomely conservative. Nothing fancy going on in there. The Soul EV's interior is more quirkily styled than the e-Golf's, but isn't the reinvention the BMW i3's cabin is. For the EV, Kia added digital instruments, some white trim plates to the center stack and center console, and light gray seats with blue piping. As with the exterior, the contrast is sharper than I prefer. The charcoal interior in the last gas-powered Soul I tested appeared less cheap and more tasteful. Still, the interior of the Soul EV is more fun than that of the staid e-Golf. Volkswagen managed to package the e-Golf's 24-kWh battery pack so well that neither passenger nor cargo room is reduced. Kia didn't do as well with its 27-kWh pack, and the Soul EV has three fewer inches of rear legroom than the regular Soul as a result. Still, this leaves it with about as much rear legroom as the e-Golf, and more than you'll find in other compact EVs. If you want a compact EV with an adult-friendly back seat, these are the ones to get. Rear seat passengers don't get rear air vents in the Soul EV, but they can get seat heaters. The e-Golf has the vents but doesn't offer back row bun warmers. Why Not the 2015 Kia Soul? I've already picked on the worst aspects of the 2015 e-Golf, its infotainment system and its prosaic styling. The worst aspect of the Soul EV is less evident. As we'll see, it doesn't drive as well as the e-Golf, but it still drives pretty well. I'm left with price. While a gas-powered Soul undercuts a gas-powered Golf by about $3,500. switch to EVs and the difference falls to $1,500, and even shifts in favor of the e-Golf if content is taken into consideration. Looking at the 2016 prices for the tested cars, the Soul EV+ lists for $36,775, the e-Golf SEL Premium for $36,415--in both cases before a federal tax credit of $7,500. How can this be? Apparently Kia charges far more for its EV bits. Even after the tax credit a Soul EV costs about $4,000 more than its gas-powered sibliing. VW? After factoring in the tax credit an e-Golf actually stickers for a few hundred less than an equivalent Golf 1.8T. To be fair, it's not that Kia's pricing out of the norm, but that VW's upcharge is well below the norm. I've focused on what it costs to buy these cars. With EVs many people opt to lease, and I'm hearing that lease payments might be much lower for the Soul EV than for the e-Golf. If you find this is the case in your area, and you plan to lease, then scratch this "why not." Like all EVs, both the Kia Soul EV and the e-Golf feel quicker than they actually are, and especially energetic at around-town speeds, because electric motors deliver their maximum torque instantly and at low rpm. The run from 30 to 60 MPH isn't as impressive as that from zero to 30 MPH, but when pressed neither car feels sluggish. Either can get from a dead stop to 60 MPH in about ten seconds, which was the boundary for "quick" not terribly long ago. Beyond their instant-on nature, electric motors are also much smoother and quieter than gasoline ones. As a result, driving an EV around town can actually be relaxing and soothing. When I reviewed the second-generation Kia Soul I found it a vast improvement over the original in terms of ride, handling, and overall refinement. I didn't have as positive an impression of the Soul EV. Its steering felt overly light and artificial, its ride felt a little bobbly, and in general it felt just okay, like a good transportation appliance. Blame the e-Golf. The e-Golf rides and handles at least as well as the regular Golf, which has the best chassis in the compact car class. The steering feels just right, the car feels eager to turn (a brake-based torque vectoring system assists), lean is minimal to the Soul's moderate, and composure remains exemplary even across badly scarred pavement. The Soul EV's ride, while far from punishing or even annoying, can feel somewhat busy on subpar roads. The e-Golf, in contrast, has the road manners of a more expensive car. Neither the Soul EV nor the e-Golf offers the latest safety features such as forward collision warning, automatic braking, lane deparature warning, or blind spot warning. This is a bit of a surprise, as some are available on the regular Soul and all are available on the regular Golf for 2016. Both tested cars had obstacle detection at both ends, but this aid to parking is of limited value in such compact cars. The Soul EV does offer a few luxury features not available on the e-Golf: cooled front row seats, heated steering wheel, heated second row seats, leather upholstery, and a panoramic sunroof. Of course, none of this matters if you cannot even buy Soul EV where you live. As I write this, the car is only available in some states: California, Georgia, Texas, Oregon, Washington, Hawaii, New York, New Jersey, Connecticut, and Maryland. The list is a little different for the e-Golf: California, Conneticut, Maine, Maryland, Massachussetts, New Jersey, New York, Oregon, Rhode Island, Vermont, and Washington, DC. More states will be added in the future. If not for the e-Golf, I would have been impressed by the Soul EV. Kia's first attempt at an EV is a good one. It accelerates, brakes, steers, and rides more than well enough for typical daily driving. Plus it has enough interior space for four adults. Plus it has a very well executed EV-specific infotainment system. Could I live with it? As long as I had (or could rent) another car for the few days a year I need to drive more than 90 miles, absolutely. The problem is, the e-Golf has as much space inside, and costs about the same, but handles much better. I didn't mind driving the Soul EV, but I thoroughly enjoyed driving the e-Golf. If only the Volkswagen was half as exciting to look at as it is to drive. The Soul EV does better in this area, largely because the regular Soul has quirkier, more visually interesting styling than the regular Golf. The blue+white color combo isn't to my taste, but others are available. Any EV is cheap to operate. But cheap electricity is of no use if the battery runs out before you can get to a charging station. The Soul EV can go about ten miles farther on a charge than the e-Golf can. For some buyers this alone will make the Kia the winner. As smooth as an electric motor, because it is an electric motor. Plenty of punch for daily driving. The Soul's cargo area has less length but more height. Kia and VW each provided a car for a week. Tom Kelly at Erhard BMW in Farmington Hills, MI, helpfully provided an i3 test drive. Tom can be reached at 248-699-3011. 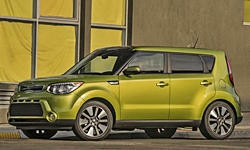 2015 Kia Soul pros and cons, according to Michael Karesh: the best reasons for buying (or not buying) the 2015 Kia Soul. Join TrueDelta to post your own impressions.